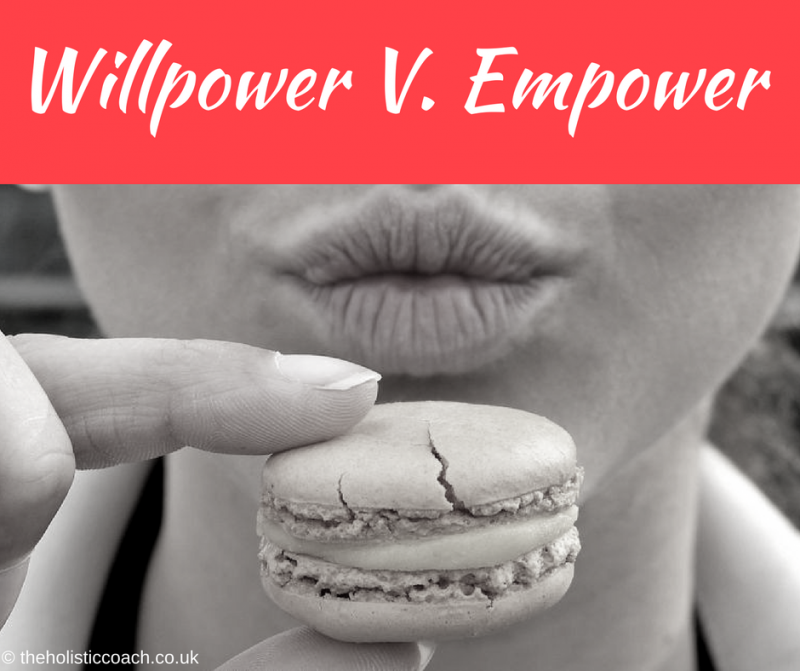 Willpower, some of us have strong willpower but does that mean the rest of us have weak willpower? What even is willpower? The willing of power? The willing of anything never truly works because you get held in the ‘willing’, the wanting of what you have not yet achieved. Willpower is connected to our thought patterns, if we believe we have enough willpower then we do. It is not enough to simply think you have enough, as with most things, you have to believe it to achieve it. This brings us back to the subconscious programming that we all have, which varies from person to person. This explains why some of my clients are ‘on it’ immediately after a consultation, compared to others who change their behaviour patterns more slowly. There is no right or wrong, but it is explains why relying on good ol’ willpower isn’t going to cut it if your goal is to lose weight. As a society we are exposed to endless temptation. Food manufacturers have most of us addicted to something. They play with our tired minds ensuring that ‘sugar’ is wrapped up exactly how we like it, be it as a chocolate bar, a cookie, a cake and even a ‘healthy’ cereal bar! Willpower is not enough to resist the constant bombardment of tempting goods that keep us wanting more. The foods that are constantly there! This list is not exhaustive because so many factors that affect our willpower. So, if you want to become empowered around food you need to change tact. Forget fad ‘diets’. Choose whole foods that suit your body, that your body tolerates well and makes you feel energised. A healthy balanced approach that includes eating a rainbow coloured variety of fruits and vegetables with plenty of protein and healthy fats works. Keep it simple. Appreciate your body. When I ask a client would they feed their typical daily food to a child and their reply is ‘no’, it is time to start showing your body some love. Your body is your amazing vehicle, show it the respect it deserves, afterall where would you be without it? Plan and Prep. There isn’t too many ways to short cut this but to batch cook, freeze and prep what you can in one session. Chopped veggies will last for up to four days refrigerated and mixed fruits freeze well already combined in your favourite smoothie recipe and will blend well from frozen or thawed. Makes dietary changes at a pace that suits you. Some people prefer to gradually phase in changes so that they have time to secure it as a new habit, whereas others wipe the slate clean and start afresh in an instant. Work with how you operate not your neighbour! Address your cravings. Knowing why you crave what you crave is very empowering because it becomes more conscious than subconscious allowing you to make a decision. If you keep going back to the food, ask yourself why and start to manage that answer. I hope this helps you to know that you are not alone when it comes to dwindling willpower! Willpower really is of no use to most of us unless you are hardwired to believe that you have enough.